Hardwood flooring is looked upon by many as the flooring option that lends a sense of permanence to an interior. Whether it's a residential interior, or an office installation, hardwood flooring adds an air of class, as well as structural strength. For these reasons, hardwood flooring remains to be a classic choice. It is a flooring option that has the advantage of tradition behind it; many cultures and civilizations have used hardwood flooring, and have done so for centuries. But, there are reasons beyond those of tradition that make hardwood flooring a practical and decorative choice. One of the most attractive attributes of hardwood flooring is the range of options open to you in terms of finish, surface, stain, and species. All of these aspects play a very important role in determining the look of your flooring. With all of these choices, hardwood flooring is known to make for a unique effect in each interior. To this point, an advantage you will experience will most likely be all of the compliments you'll get because of your hardwood flooring for years to come. Hardwood flooring can be purchased in either prefinished or unfinished varieties and there are distinct advantages in both. For pre-finished hardwood flooring, the obvious advantage is that of convenience. No sanding is required for these types of hardwood floors, and therefore more time is saved on preparation as well a mess; sanding a hardwood floor involves both. Also, no time must be allowed for the finish on your hardwood flooring to dry, a period which can take a half a day to longer, depending on the kind of finish you use. As far as unfinished hardwood flooring goes, the most compelling advantage is that of a more uniform seal. This is the reason why many professionals offer unfinished hardwood flooring to clients; it is easier to make sure that all of the minute gaps between the hardwood flooring boards are sealed when finish is applied on the whole surface of the flooring, and not on a board-by-board basis. This means extra protection against moisture, the hardwood floor's most dangerous enemy. In this sense, all of the preparation and mess is worth the effort. The diversity of hardwood flooring extends not only to finish, but also in the range of surfaces and choices in stain available to the customer. Some hardwood flooring is planed evenly at the mill, offering a smooth, refined surface that many consumers have come to admire in hardwood flooring. But another variety of hardwood flooring that is becoming popular with flooring professionals and homeowners is that of the handscraped hardwood flooring. In this case, the hardwood plank is actually worked by hand to create a contoured, seasoned surface that gives the hardwood flooring a more rustic, lived-in appearance. The variations in hardwood flooring are further extended by the variety of stains available as well. Some stains serve to bring out the natural range of color in a chosen species. Others effectively change the color altogether, allowing a consumer to enjoy the benefits offered by one species, while enjoying the color of another. Hardwood flooring is probably one of the more flexible choices with regard to appearance and personal taste. Overall, hardwood flooring is not just an option which relies upon tradition, although hardwood flooring has been relied upon for centuries because it is such a durable material. What hardwood flooring offers is the luxury of choice and an ease of integration into an interior design. Along with the advantages of appearance, hardwood is and continues to be a choice in flooring that can add structural strength to a residence or office. Red and White Oak – These species are naturally pale in color, with hints of pink running through the Red Oak. Both are known for their utility across all kinds of applications. White Oak is known to be slightly harder than red oak, although red oak in turn is slightly easier to saw and nail. 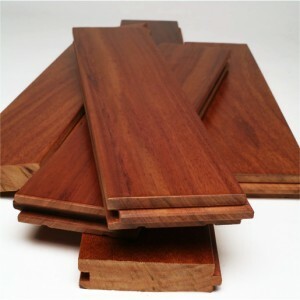 American Cherry – Used for cabinet making as well as flooring, American Cherry is known to be an attractive species that is very easy to work with. It is not as hard as either red or white oak, but offers a greater tonal range of color that darkens over time to become even more rich in tone, due to photosensitivity. Hard Maple – Harder still than oak, the uniform texture of maple as well as its naturally abrasion-resistant surface makes it an excellent choice for hardwood flooring. Early North American settlers relied upon maple for its hardy nature, and it continues to be popular today. Brazilian Cherry AKA Jatoba – One of most notable features of this exotic species is its color – a rich, reddish brown that eventually ages into a lustrous burgundy. Another important as aspect of Jataba is how hard it is; it is harder than some species of mahogany. So for look as well as durability, Brazilian Cherry excels.